The waiting place is only a pleasant experience if you like the place you’re waiting, which is so rarely the case. It’s true that the GNIB waiting place is much more pleasant than your typical DMV. There’s lots of wood and glass and it’s sort of pretty. But I got here an hour early and now, two hours later, there are still more than a hundred tickets to go before my number is called. That is to say, the ten stations each see an average of two people an hour. I’m not really liking this place. At least I am able to write this post to help pass the time. Update, an hour later: about seventy more numbers to go. So my friend and I are verging on true mental anguish. Bureaucracy is slow, surprise. In other news, the earth is still round and the sky is still blue. We’ve had some pleasant conversation between the two of us, ranging from Lake Baikal to jelly beans. But there’s only so much pleasant conversation can do when you’re facing that cruel, cruel number counter. With two hours to go, we’re realizing we might not make it. In the melodramatic sense of we’re about to die, yes, but also literally. They might close before calling our number. Black–the color of despair. Anyway, I’d love to wax philosophical about the Waiting Place, leaning heavily on Dr. Seuss’s seminal work. At this point, though, I’m just not quite feeling up to it. Not only was this evening’s experience less than ideal, the life connections to waiting that I would draw (my currently nebulous-at-best life after grad school) would be too depressing. Instead, I’ll truncate this post here. Rest assured, I have some plans for this blog for the month of November and, whether you’ll like them or not, you can at least look forward to next week insofar as it will be a bit of a change of pace. Needless to say, I am excited. Next time I write, we’ll be on the other side of 1 November. Until then, happy Halloween. You’ll all be very pleased to note, I’m sure, that I’ve now registered to register, now that I’ve registered. First, I had to register, by invitation, with Trinity in order to officially be a student. So that happened four days before school started. Now, I’ve registered to be part of a group that will go this week to the Immigration Bureau to register with them as required by law. I’m not saying that this system is worse than any other, since it’s the only one I have experienced, but I can’t help but be a little put out by the whole complicated process. But. I guess it’s a taste of what I have to look forward to if I do intend on living abroad long-term. Which I do. The state reinforcing its position of power over you. Over and over and over. Repetition is important. In other news, I had a really pleasant week. Last Friday, you may recall, was the wine and cheese social with the comrades from my program. I had a lovely time, ate some wonderful cheese, chatted and socialized, and just generally enjoyed myself. There was, in fact, a substantial surplus of cheese, and so I got to take most of my block of cheese (a wonderful Irish white cheddar with chives) home and partook throughout the week. I do really like the people in my program. They’re great. On Sunday, I had a lovely visit from a friend. She had been working in England and popped over because Dublin is a cool place. We got to do a lot of the touristy things that I’ve neglected, so that was definitely a lovely bonus. 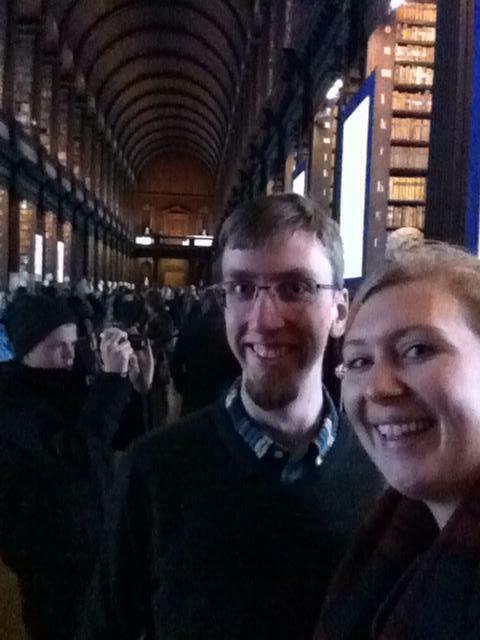 We started with the Book of Kells, which I had seen before but remains exquisite. We briefly looked around Dublin Castle which, honestly, isn’t super castley except for a big tower next to the chapel. Fun fact, the Irish ‘crown jewels’ (being the Order of St Patrick) was stolen from the castle some 300 years ago. And never recovered. Ever. Poor Ireland. We also went inside St Patrick’s Cathedral, a great building dating from the 12th century and the final resting place of such personages as Jonathan Swift, author of Gulliver’s Travels. Here we are in the Long Room of the Old Library (prize for most creative names? I think so). It’s obviously a fabulous room. 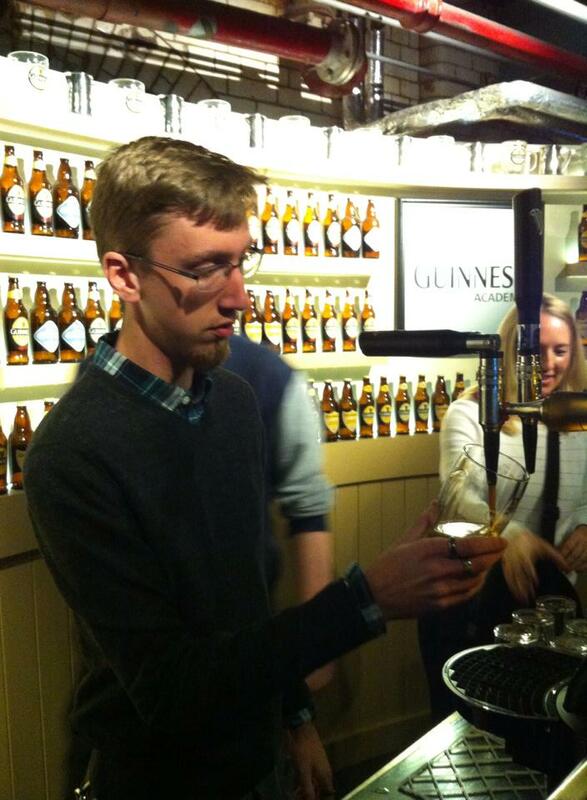 This is me learning the proper method for pouring Guinness. It’s apparently a whole thing. Not much else going on. I’m really starting to think about my dissertation, which is obviously dreadful, and the weather is getting colder. Though, it’s true today and yesterday were quite pleasant. A bit chilly and windy, but sunny and generally nice. Classes continue to be interesting and informative and involve a ton of reading. The bread I get from the bakery down the road every week continues to be delicious. My journey through various Irish candy bars continues to be fruitful. Regressing just a bit, in St Patrick’s there’s an area set up to experience different things about cathedrals from a sensory perspective, mostly intended for children, I think. 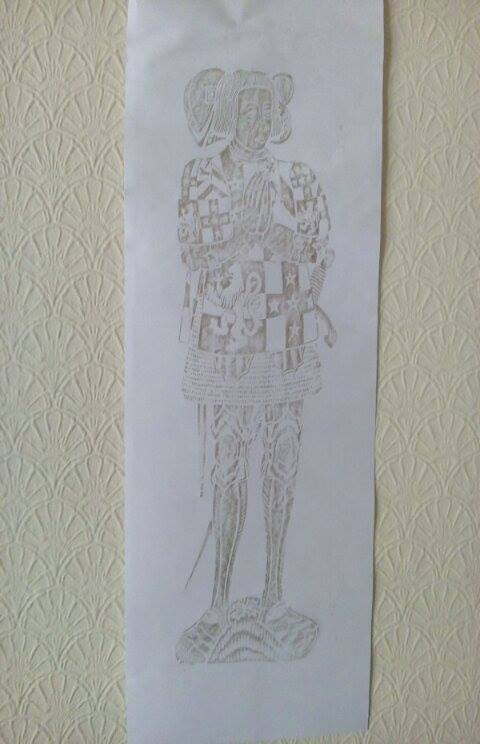 Anyway, there was a station to do your own brass rubbing and, low and behold, free art. I now have something on the otherwise blank walls of my bedroom. Quite good if I do say so myself. Which I do. So there’s that. Ah, a challenge for this week. Do something to enliven your living or working places. Get some flowers and display them prominently. Or get an air fern, because there’s really no excuse. Or make some art and put it up somewhere, even if only temporarily and even if it’s awful. It’s special because you made it. So go forth and art! 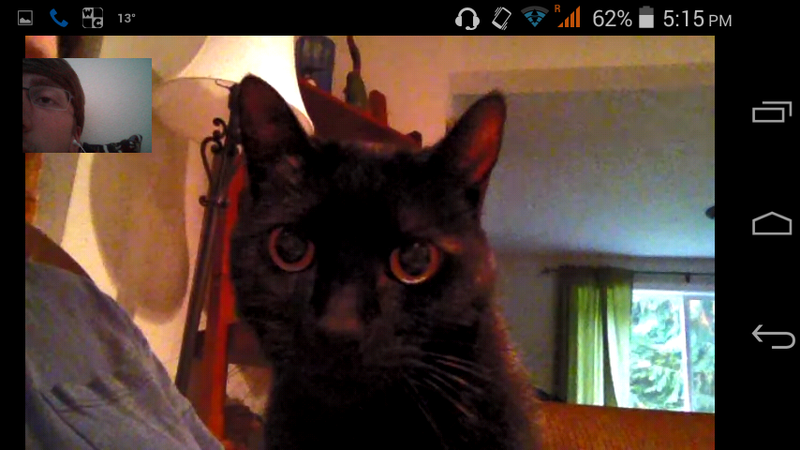 I got to video call home this past weekend and, obviously, the cats were a major topic of discussion. I mean, I talked with the parentals too. But cats. 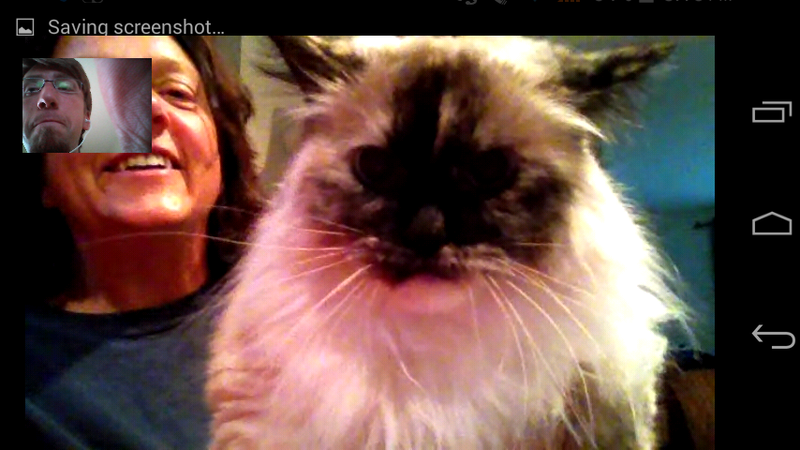 I mean, it’s too precious when you hear your kitty purring when we’re 4,500 miles apart. Too. Precious. Also in the realm of good news, you may not have been aware, but this week marked the fortieth anniversary of Monty Python and the Holy Grail. Apparently theaters across the world were showing it in celebration. I don’t have a definitive favorite movie (I’m non-committal that way) but I do have a top-five-in-no-particular-order and it is in it. The others, if you’re curious, are The Lord of the Rings (as one film), It’s a Wonderful Life, The Curious Case of Benjamin Button, and Australia. Though, in all honestly, those last two I’m not 100% behind including, though I do love them. But yeah, Holy Grail is a fantastic film, really into it. I’m a believer that most–if not all–of life can be lived quoting only it, Lord of the Rings, and maybe Harry Potter. And, thanks to my older brother, I can basically quote Holy Grail, among a variety of Monty Python sketches, in its entirety and could from a fairly early age. I’m eternally grateful for that ability. Other than this frankly momentous occasion, this week was fairly quiet for me. My classes are really interesting (with the obvious exception of Research Methods which continues to be a source of pain). This week we talked a lot about the Northern Ireland peace process (so-called) which I knew some about before but have greatly increased that base and seen some new perspectives. So basically the reason I’m in this course, yay! Shoutout to my coursemates who are all truly wonderful and who, apparently, have started reading this. My fault for putting it on Facebook, I guess. Looking forward to a wine and cheese social with them tomorrow, should be nice. The Irish are real proud of their cows, which means their beef and their dairy are highly esteemed. We’ll see, I haven’t tried much yet so far. I’m hoping their faith is well-founded because, as some of you are all too well aware, I like cheese. On an unrelated note, I’ve had a song stuck in my head periodically for the past long while (as frequently happens with me) and I thought I’d share a bit about it. When the AU Chamber Singers went on tour to Russia, we sang a liturgical piece called Неизреченное чудо, a beautiful and almost haunting, if brief, song. (I laugh at those of you who were expecting something you might recognize). I highly recommend a listen, just copy and paste that title into YouTube, it’s really lovely. A very free translation of the text might say something along the general lines of, “Inexpressible wonder that the one who rescued the youths from the fiery furnace is now laid breathless in a tomb for our salvation.” The single line ‘inexpressible wonder’ (which is, by the way, the title) keeps coming back to me. How incredible is it that literally the most important entity in the universe suffered a horrendous death for my sake? And that he then rose again to prove his victory. It’s just wow. In another Monty Python film, Life of Brian, a random man in Jerusalem is mistaken for the Christ and accidentally develops this whole following. It is, in accordance with Monty Python style, very quotable and just generally humorous. But I’m reminded at this juncture of 1 Corinthians 1:18 which says that the message of the cross is foolishness to the world. The idea of the cross is just silly, that God would sacrifice himself for us. How radical. What an inexpressible wonder. Golly, two weeks through classes and just over a week into October. In some ways (mostly while struggling to remain awake through gruelingly dry academic writing) it feels like time is moving slower than ever, while at the same time it’s absolutely flying by! It makes me excited to get out into the world and do things as, like, a real adult. Well, excited and scared (yes that’s Into the Woods, yes it’s a wonderful musical, yes you should see it–film or stage, though the stage is better). I don’t have a whole lot to report about this week. I spent most of my time doing readings because, let me tell you, there really is a lot of reading involved. A lot. And, no surprise at all, Research Methods is the actual worst. The. Worst. But I think I’ll survive and that’s what matters, yeah? I did last Friday go with some friends to Dún Laoghaire to watch the sunset. True to form, however, it was way too cloudy to see anything of the sunset other than to note the change from white to black. So we just had dinner and ice cream at this great little place called Scrum Tiddly’s (what a wonderful name). They give you a tall cup of soft serve and three toppings. I had white chocolate chips, fudge pieces (the normal yellowish kind, not chocolate), and these sprinkle-covered chocolate patty sort of things. It was a grand time. Also, any ideas on how to pronounce Dún Laoghaire? I’ll give you a hint: it’s not Doon Lah-oh-ga-hair. That’s right, it’s Twinkle Twinkle Little Star! I mean, Dun Leery. Because Irish. Anyway, it’s been a while since I actually told you anything about being in Ireland and Dublin as such, so I thought I’d throw you some fun facts and what have you. I think it’s pretty interesting (good thing I’m here, yeah?). While I have known for a while that the two main cathedrals in Dublin– Christchurch and, surprise, St. Patrick’s– are both Church of Ireland (which is to say, basically Anglican even though the vast majority of the Republic of Ireland is Catholic) I learned this week that the Catholics don’t really have a replacement. They have what I guess is called a pro-cathedral which, instead of being for professional Catholics, is essentially an interim building used when a cathedral isn’t available. It’s just temporary. Only, like, two hundred years. That’s temporary, right? Whatever I may have about Catholics, I think it’s really sad that, with Ireland being independent and Catholic ruled since 1922, their cathedrals are still controlled by the minority that has a whole lot of repressing under its belt. Cue philosophical musings for the week. I don’t know to what extent you guys actually read or care about this part of my entries, but it doesn’t really matter. As I said at the beginning, this is part newsletter and part journal. I always hate reading other people’s (and my own, years later) supposed ‘philosophical’ writing, but that has yet to stop me from writing it. And I do take it as a way to sort of process things, even if it’s only tangentially related to the actual musings at hand. One way or another, it’s certainly a good way to fill out my posts. One of my course readings was talking about the changes in identity formation and meaning in the modern era. Something the writer (Zygmunt Bauman) said really got me thinking, though I took some liberties with what he was actually talking about. There is a tension between our pilgrim nature which asks, “How do I get there?” and our vagabond nature which asks, “Where should I go?” This seems to me a succinct summation of a lot of life’s challenges, as little exposure to them as I might have. Part of us struggles to find our way, and part of us struggles to walk down it once it’s found. How do you find yourself right now? Are you searching more for a destination or for means of traveling? If you happen to find my way, please return it as it was lost years ago (yes that’s from Phantom Tollbooth, yes it’s an amazing book, yes December is National Reread Phantom Tollbooth Month). Happy October! Fun fact, the Croatian language has retained some really old terms, including month names. Most European month names are real similar, with French (octobre), German (Oktober), even Russian (октябрь). But the Croatian is Listopad, which means basically ‘leaves fall.’ So that’s cool. Done with classes for this week. I’ll reserve judgment, since I’ve only had each class once, but I will say preliminarily that I anticipate this term being pretty solid. The major exception, of course, being Research Methods which, while the professor seems good and I don’t think the work will be extraordinarily difficult, represents a particular and vicious form of torture for my personal brain function. But other than that, initial lectures and discussions have been really good. The Social Policy class in particular, I think, is going to open up a lot of interesting avenues generally but also perhaps toward a topic for my dissertation. Most of you are aware that I’m interested in the former Yugoslavia, generally in partition/secession theory, and how to deal with regional post-conflict integration, especially with the gradual accessions to the EU and that whole issue. An enduring side interest, however, is language and minority languages in particular. So social policy can offer some important insights into management of education in multi-ethnic, multi-lingual societies where the language you speak is a political statement in and of itself. This being the first week of classes, it was also the first rehearsal for Choral Society. This term, we’re doing Handel’s Messiah which, fun fact, had its world premier in Dublin in 1742. Also, the Choral Society has been around since 1837, which is rad. Anyway, let me tell you that it feels so good to be back in music. I mean, it’s only been four months, but the uncertainty about what my music life was going to look like here really had me worried for a while. But here I am, all is well, the group is fairly good, I’ve met some nice people, and expect to really enjoy being a part of it. So yay on that front. Music is so important to me. It’s been a huge part of my life for a really long time. I’m not one of those people who have been playing piano since they were six, but I nonetheless have a huge part of soul that is alive only when I’m making music. And I have been in choir since I was nine. There’s a great poem set to a few pretty well-known pieces whose first line says, “If music be the food of love, sing on.” I totally agree, and really love the poem, but it falls a little short of really getting music for me. I see music more as the food of life. You can live without it for a bit, and not everyone is great at preparing it, but it’s real important. It comes in an unbelievable variety of forms, instrumental or vocal or both, genres beyond count, a huge number of historical and cultural options, on the stage, on the radio, on YouTube. It’s remarkable. Music is just real great. Aside from those developments, it’s been a fairly mundane week. I took the DART train for the first time and didn’t die. I finally started Count of Monte Cristo. It’s really good. Not much else to report on this front. October is here and that means that November is continuing its steady creep toward the present. Here’s a challenge for you, I guess. Think of something without which you aren’t certain you could live. What would you say is the food of life? I don’t mean, golly I couldn’t live without Netflix/my phone/quesadillas/cats/Hugh Jackman movies (wait, did he include cats in that list?!?!). Take a moment to share that passion with someone you care about. And if someone shares with you, just bear with it even if you think it’s lame. Relish how much the other person enjoys it. I think we could all do with a dose of empathetic passion, yeah? Plus, it’s cool to learn things about the people we are surrounded by. FYI, my answer is music.